Calcasieu Parish Sheriff’s Office detectives received a complaint in reference to a shoplifting that occurred on February 11 at a local grocery store located on Ryan Street in Lake Charles. Upon further investigation detectives obtained surveillance footage of a man and two women leaving the store with approximately $1,000 worth of stolen items. The Calcasieu Parish Sheriff’s Office is asking the public for assistance in identifying the suspects seen in the photograph. 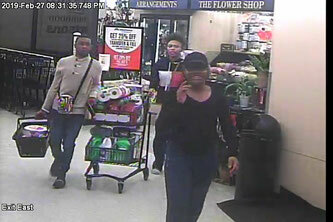 Anyone with information regarding the theft or the suspects is asked to call CPSO at 491-3605. CPSO Detective Mike Conner is the lead investigator on this case.